Screen-the-screener to get a shot for 4. 5 cuts to the high post, 4 ballscreens for 1, 2 uses a baseline screen from 3 (a decoy screen), 5 screens for 4 to get a pass. 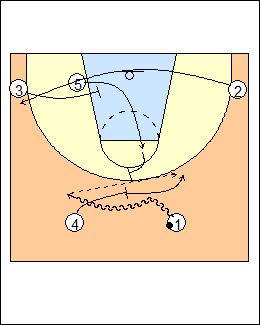 See Tactics - Lawrence Frank ballscreens (L-action), Quick hitters - Ravens 2015, High and wing.